The higher-level systematics of scorpions has been significantly revised and discussed in the recent year, not without controversies.The family division chosen in The Scorpion Files are not accepted by all researchers, but fortunately more research are being done making the picture more clearly. There may be changes in the family structure in The scorpion Files in the time to come when I have the time to review recent contributions on higher-level systematics. 1. As presently defined, Vaejovidae is diphyletic (Uroctonus are not true vaejovids). 2. The true Vaejovidae (excluding Uroctonus) are the sister group of Scorpionoidea. 3. To accommodate this tree topology, the study established two superfamilies to redress the paraphyly of Chactoidea: Vaejovoidea and Superstitionoidea. The scorpion Files doesn't list higher-level systematics, but it is important to note that status of Uroctonus Thorell, 1876 has to be set to incertae sedis because it doesn't belong to either Vaejovidae or Chactidae. More studies are necessary before its family placement can be decided. Until this happens, I keep the genus in Chactidae. The Neartic family Vaejovidae (Scorpiones: Chactoidea) has long been treated as a diverse and systematically cohesive group of scorpions, but its monophyly and relationship to other scorpion families have historically been questioned. Morphological data have supported its monophyly and a variety of phylogenetic placements within the superfamily Chactoidea. Recent phylogenomic analyses have instead recovered vaejovids as polyphyletic (albeit with minimal taxonomic sampling) and Chactoidea as paraphyletic. 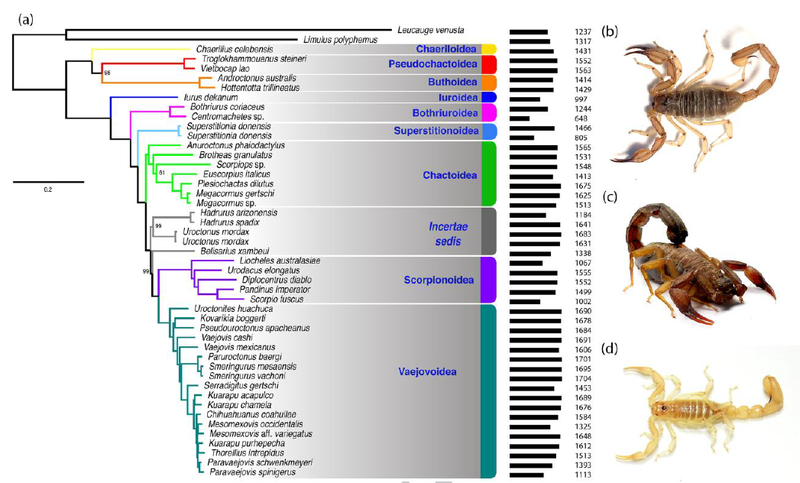 Here, we reexamined the monophyly and phylogenetic placement of the family Vaejovidae, sampling 17 new vaejovid libraries using high throughput transcriptomic sequencing. Our phylogenomic analyses revealed a previous misplacement of Smeringurus mesaensis. Regardless, we recovered Vaejovidae as diphyletic due to the placement of the enigmatic genus Uroctonus. 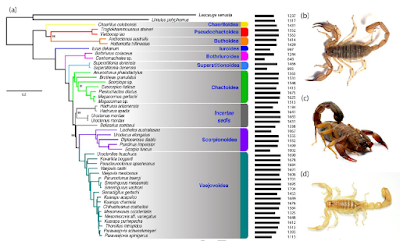 The remaining vaejovids formed a clade that was strongly supported as the sister group of the superfamily Scorpionoidea, a placement insensitive to matrix completeness or concatenation vs. species tree approaches to inferring the tree topology. Chactoidea was invariably recovered as a paraphyletic group due to the nested placement of Scorpionoidea. As first steps to resolving the paraphyly of Chactoidea, we take the following systematic actions: (1) we establish the superfamily Superstitionoidea (new superfamily) to accommodate Superstitioniidae; (2) we restore Vaejovoidea (status revalidated) as a valid superfamily that excludes Uroctonus; and (3) we treat the families Caraboctonidae, Troglotayosicidae, and the subfamily Uroctoninae as incertae sedis with respect to superfamilial placement. Our systematic actions thus establish the monophyly of the presently redefined Chactoidea and Vaejovoidea. Thanks to Dr. Prashant Sharma for sending me this article and for explaining to me the main points of this study. Thanks also to Carlos E. Santibáñez-López for sending me the paper.